Trainers are the ultimate street style must-haves. How many ways can you wear one pair? The days of sportswear items not having a place in someone's work wardrobe or casual everyday looks have long gone. Sneakers are now definitely street style-worthy, and the styling possibilities you can play around with are endless. The trick is to balance form-fitting bottoms with a loose top—perhaps an oversized button-down or a cozy sweater. For men, you can cop this laidback look worn by Khalil Ramos and switch the slouchy top with a long tee and an unbuttoned denim jacket. Look for bright accents like neon details if you want to add spice to your black sneakers. White sneakers have become a sartorial phenomenon, and the best part about them is that they go with everything. 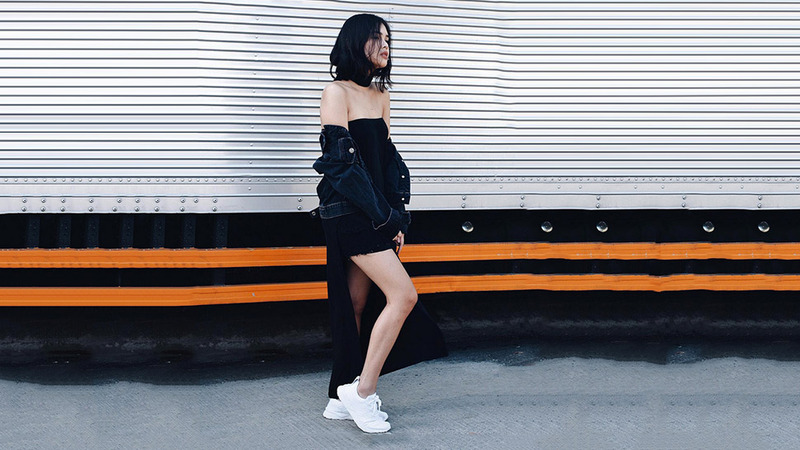 Dress down your dresses for traveling, maybe try on the choker trend, and go for that sultry, laid-back vibe, just like Bea Marin in this gorgeous snap. Now all you need is that statement bucket bag to pull off this relaxed look that's perfect for summer! Alternatively, take your cue from Ida Anduyan, and pair your white sneaks with your cut-off denims and a top in blush tones. When all else fails, Juliana Gomez says, stick to a foolproof choice like the ripped boyfriend jeans. Give any sporty outfit a more playful kick with two-tone or multicolored trainers. Throw on a bomber jacket over your cropped top or sports bra to complete your athleisure-chic look and make it appropriate for outside the fitness studios or even for dress down days at work. Dani Barretto's pick is this lavender pair. Here's a cool pair for guys who love sporting matching shoes with their girl. When twinning in turquoise-hued sneakers, take you cue from the Karl Ivan Jover Presentacion, and wear dark jeans. Play around with a funnel neck moto jacket or hoodie over your t-shirt. At the end of the day, it all boils down to investing in a versatile pair of shoes. With each version's sleek, modern silhouettes and enticing colors, the adidas ZX FLUX fits the bill perfectly. You have infinite styling possibilities with the collection! Pick any of the striking color combinations and playful prints to make office outfits more street-ready. Choose "wear-anywhere" neutrals like solid black sneaks or two-tone gray and white versions to give your touristy #OOTDs and other casual looks a sporty twist. Shop for your own adidas ZX FLUX now on shop.adidas.com.ph. Follow adidas on Facebook, Twitter and Instagram for more updates. This article was created by Summit StoryLabs in partnership with Adidas.